Sometimes it is a good thing to think outside the box. When you sell directly to a real estate investor instead of a real estate company in Tucson, you may be able to get a better deal. There are many advantages to selling your house through a real estate investor. Some of the best advantages are listed below. 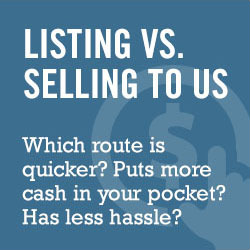 If you need more information on how to sell your house in Tucson, call us at (520) 433-9298. We are always happy to talk to you about selling your house and we can offer options that you may not have thought about before. Contact us today and you’ll see that getting a real estate investor puts the power back in your hands and you will learn how to avoid real estate agent fees when you sell your house in AZ, Tucson.